Born near Walawala in the Gibson Desert in WA, Naata Nungurrayi and her family walked into Papunya in the mid-1960's when they met the Native Welfare Patrol led by Jeremy Long. Naata is the sister of Nancy Nungurrayi and George Tjungurrayi and the mother of Kenny Williams Tjampitjinpa and Tjitji Ross Tjampitjinpa. She now lives with her family at Kintore. Although her painting practice has ceased. Naata began painting with the Papunya Tula Artists in 1996. 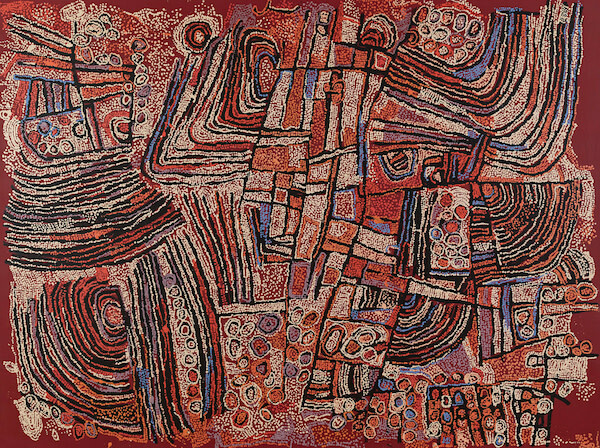 By 1999 her work was included in Twenty Five Years and Beyond at Flinders University Art Museum and in 2000 her work was included in the landmark exhibition Papunya Tula: Genesis and Genius, held at the Art Gallery of New South Wales. Naata's paintings depict her country Walawala as well as women's ceremonies around the Marrapinta, a sacred waterhole west of Pollock Hills. Other sacred sites and stopping places for travelling ancestral women depicted in her paintings include The Ngaripunkunya rockhole west of Kiwirrkurra; the Wirrulnga rockhole east of Kiwirrkurra; Ngaminya rockhole south and Wanku and Piti Kutjarra soakages northwest of Kiwirrkurra. Naata often painted her 'home' which is Karilwara, two rockholes located northwest of Kiwirrkurra. Her dreaming stories depict women gathering Kampurapara (desert raisins) which are eaten straight from the plant or ground into a flour and baked. Naata records her country with tali or sandhills, puli or rock outcrops and punti or vegetation. The final works of Naata’s career, arguably her most poignant, comprise a suite of remarkable and visually striking paintings incorporating in their iconography the petroglyph images from the desert, which Naata saw as a young woman growing up in central Australia. Produced from 2008-2010, this group of paintings was published in 2016 by Christopher Simon of Yanda Art, who represented Naata’s career. Iconography 41, exhibited in Into Abstraction, at Brenda Colahan Fine Art, March-April 2018, is one of this group. Naata is widely regarded as one of the leading women artists of the Western Desert. In 2003 her work was used as a motif on an Australian stamp.